I got my Juniper Bonsai tree about 2 weeks ago. It came in a small pot at first you can see from the picture. I've been keeping it outside to help it go into dormant state for the winter and I thought a bigger pot would be less likely to freeze. I also thought putting more pebbles around the top would keep it from freezing on the top layer of soil like it kind of did. It hasn't gotten below 15�. It has been 32� the past two days and last night it was around 22�. I have read that the soil should be moist when it's in the cold. Since I had just put in new Miracle Gro Potting Soil that was dry I watered it just before I put it outside before I had to go to work. So it's inside now so that top layer can thaw. How can I tell if the tree has gone into dormant state? And when it has does it need to remain outside? What should I look for if there may be frost damage? Because I saw some white needles just now. I heard I shouldn't prune it this time of year because the open woulds can freeze easy and hurt the tree. I did do a little bit of pruning when I first got the tree. You can see from the picture with the smaller pot to the bigger I took off some parts that were growing strait up and down. A friend from work has been taking care of a few bonsai trees, and he has had for 6-7 years and he told me to water it about twice a week or to just make sure the soil is moist. On the tag when I bought the tree it said that it needs watering everyday. I've just been keeping it moist so far. When I repotted it there was a worm in the soil. 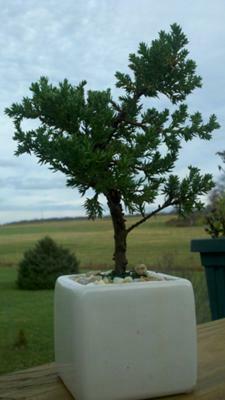 I read that the worm helps prevent root rott which is common in juniper bonsai. And I assume it can keep the soil loose. Thank you. That's awesome that it can stand that freezing, I'll just leave it out. I'll read up on that site thanks. Do you mean mulch on maybe the top layer? Or top and outside of pot? I have a crap load of extra mulch all around the house outside. Go to bonsai4me.com and read as much as you can. Bonsai soil is more open allowing water to go in and out without remaining saturated. Junipers grow high in mountains they can stand below freezing. They can't survive inside no tree ever does good inside. Your repotting wasn't ideal but if you keep it protected and outside it should be fine. If you can maybe some mulch will help. Im from Florida so mine stay on the shelf all winter. But junipers are tough and can handle cold freezes. Just go to that website and read all that you can. 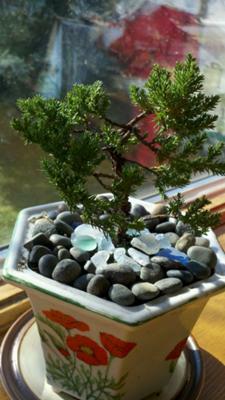 Welcome to the world of bonsai and om glad you chose this great hobby and art! Scipio NY, just south of auburn. Outside all the time? It get's around 0 degrees farenheit in the winter, and occasionally below that. What's the difference between potting soil which I used and Bonsai soil? I have a box strapped to the top of a garden hose coiler. The box is a broccoli box from work that is waxed to help against wetness, and the front is cut out so it can get sun. Do not bring it inside and only water when it gets dry...not completely dry but almost dry...optimum repotting time is spring but if you are careful ot should make it. Don't do anything else to it for awhile...just let it grow and watch it. Maybe in a little while get it into bonsai soil. Watering it in pure garden soil is going to be hard to judge. Where are you from and I might can help further...maybe put it on the ground where its out of the wind...hope this helps.